Once it was a rarity that a meteor fireball was accidentally caught by a surveillance or a police car dashboard camera - but now it has happened twice within three days, first in the U.S. during the maximum night of the (otherwise unimpressive) Leonids and unrelated to them, then in South Africa. • From the South African bolide of 21 November an overview & many reports, a video (also here, plus three stills), a different video (also here and here), a video of the sky brightening and more news coverage here, here and here. • From the November 18 bolide over Utah which caused a lot of excitement (and was also seen from other states) many videos exist, e.g. shown here (nice TV report), here and here, also this (also here), this, this, this, this, this and this one. One could try to triangulate a possible strewn field, unfortunately in a restricted area, to the chagrin of would-be meteorite hunters ... A report, several more, the residual cloud in the sky and a lot of coverage here, here, here, here, here, here, here, here and here, with more news linked here, here, here, here and here. The Leonids of 2009, according to the worldwide visual data as of today, fell below even the most pessimistic predictions, with a peak ZHR of barely 100 (around 20:30 UTC on Nov. 17) - this would be less than half of what any of the three Perseids peaks reached this year: an early summary and links collection just 24 hours later, another early summary, more reports - and videos! - from the Philippines, Singapore, Nepal, India (again, plus preparations), Canada and the U.S., a picture, a less than informative wire story, one more model, a preview of net sources and more, more and more previews (also a bad and another bad one). • More recent fireball reports here (hi-res pic), here, here, here, here and here and stories about the European Network of fireball cameras and an Aussie meteorite problem. 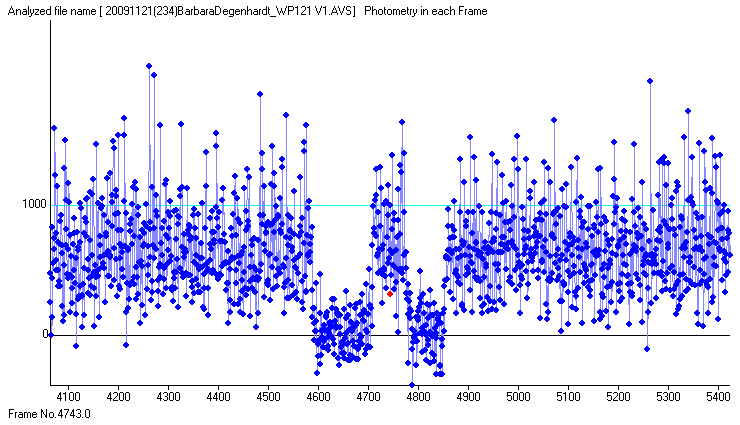 • The Barbara occultation event was observed: Here is a one lightcurve apparently confirming its binarity. 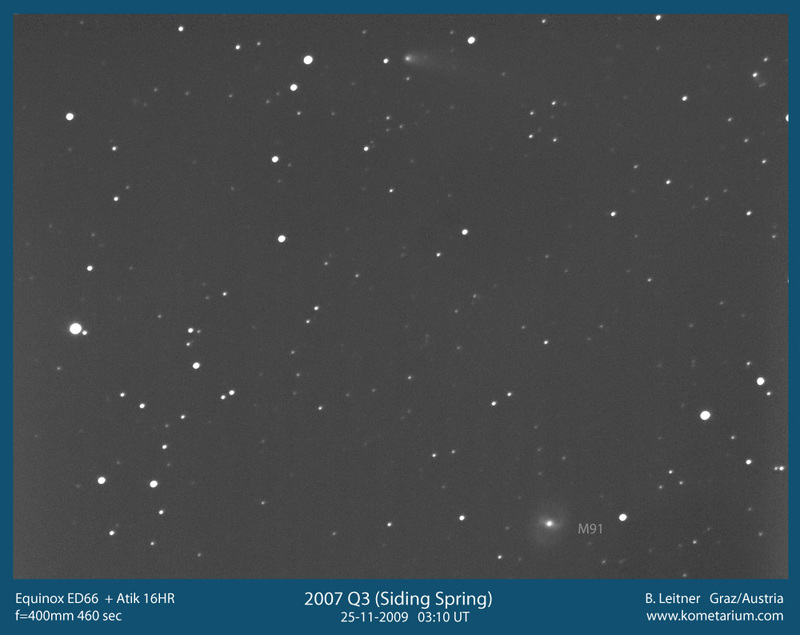 • Cometwise we have C/2007 Q3 in the Virgo Cluster: pictures of Nov. 13 and Nov. 25 - plus a call for vigilance re. 107P. In other news modest activity on the Sun (but a nice prominence and news about solar 'tsunamis' and a possible climate role in past centuries). 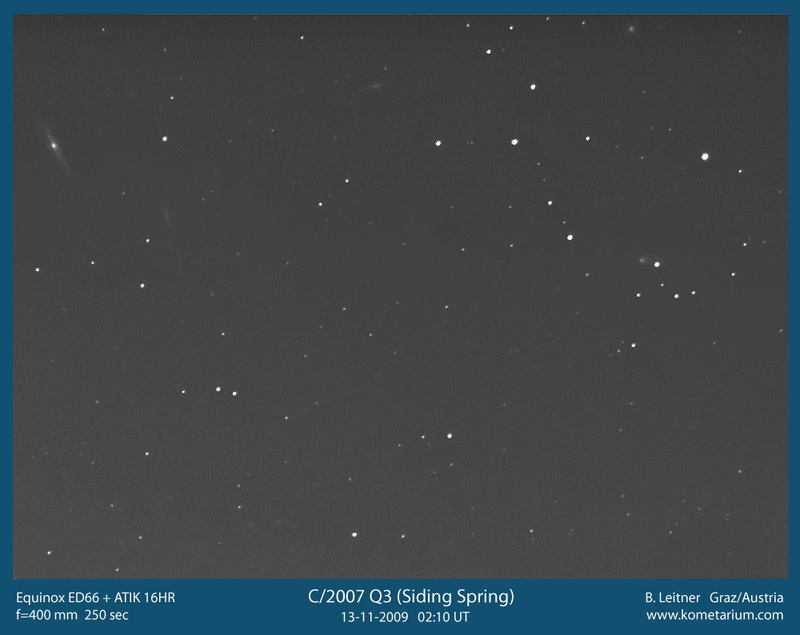 • The eclipse of Eps Aur is progressing, a nova in Scu reached 7th mag. while Nova Eri even reached 5th mag. (but now it's down to 8 mag. ), Mira is near maximum, Eta Car is brightening and should be watched as might be Zeta Aur. • There are now 50 named moons of Jupiter. • A nice video of the Oct. 21 Antares occultation by the Moon. • An amateur observatory designed with wheelchairs in mind. • A new Galaxy Zoo project involving galaxy mergers (more, more, more, more, more, more und mehr. • And finally four amateur astronomy personality stories about Jones, Boles, Legault and Mellinger.